Wesley Ryan has fond memories of the small Ozark town of El Dorado. Seeing it as a safe place to put his failed relationships behind him, Wesley moves into his grandparents’ old home and takes over the local veterinary clinic. An early morning visit from Travis and his dog stirs feelings that Wesley seeks to push away—the last thing he needs is to fall for a man with baggage and three kids as part of the package. Life, it seems, has other plans. Well, hello Mr. Brandon Witt! So happy to have read my first book by you! I could tell within the first few pages that I was going to be a fan of this author’s writing. It’s lyrical without being too purpley. It’s descriptive without digging itself into a hole with too many details. I felt like I was sitting at the author’s feet listening captively as he told the story. I’m excited to read more from him. 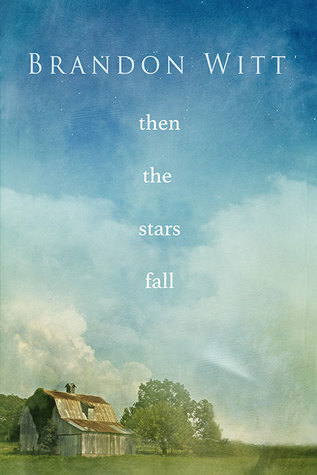 Then the Stars Fall is a book about a small town…being a local, being a newbie, being a good ol’ boy, being different, being a church-goer, being an individual…being family. Travis is a widower with 3 amazing children, a sassy sister, and a boisterous best friend. He loved his wife dearly and his loss and his mourning and his grief were apparent on every page. Wesley comes to town having inherited his grandparents house…a house he visited summers growing up. Memories that he hopes will help him heal from a hard breakup and figure out who he is. He dresses “city” and wears flashy colors and the small town doesn’t quite now what to do with him – love him or hate him. This book is emotional, but in a quiet way. It has a permeating sadness due to death, small-mindedness, and bigotry. I love small town books…but I also find them hard to read. I often think I want to live in a small town where everyone knows one another and knows each other’s business. But the small-mindnessnes, the hate, the intolerance of differences…they break my heart. It broke my heart in this book. The town itself feels like it’s own character. And each town person played a role in the story. They were the strength, both the good and the bad, of this book. Unfortunately, because of this, I feel like the romance between Travis and Wesley took a back seat. The story was about two men, but it was more about them as individuals and how they deal with the town’s reaction to their coupling, than it was about the relationship between the two. Also…as much as I enjoyed the writing, the book lost some momentum for me about halfway through. By the end, though I was still engaged for the most part with the story, it felt long. There are long books and there are long books that feel long. There were times I was getting impatient by how slowing my reading progress was going. Despite that, I felt glad at the end for having read it. I’m excited to read more from this author. And if you’re looking for a lovely book with strong story, and memorable characters…more than a driving romance…this might be a good option. This entry was posted on December 2, 2014 by BioB in Contemporary, Reviewer: Susan and tagged 3.5 Stars, brandon witt, dreamspinner, small-town.